Kirk Wong is a director I only know as the man behind Crime Story and The Big Hit. The latter was his Hollywood debut and a movie I never finished watching (I barely started actually). Now a few year afterwards I've heard positive things about it, so I'll probably give it a go some day again. But this is about the 1988 production Gunmen, a movie obviously inspired by Brian De Palma's The Untouchables made the year before. Unless it's a remake I'm more than willing to watch a Hong Kong version of a successful American movie. When a thing like that is done it should be seen as an homage rather than a copycat in my opinion. This Tsui Hark production is blessed with a big budget but even the most beautiful sets in the world can't hide sloppy filmmaking. The last remark is actually kind of unfair because in this case I solely blame the flaws in this movie on the script and not the the directing. Kirk Wong does show some off some solid directing and paces things as good as he can, something which is important even in short movies like this. The costly sets and costume design deserves a 2.35:1 framing but we still get a good look at the period settings and wear while still watching the story unfold. Stylish traits from Kirk include some interesting wipes and iris-like effects between one scene to another, a way to also take us back in time I guess. Kirk Wong knew what he was doing but the scriptwriters didn't. The structure of Law Gam Fai and Lip Wang Fung's screenplay is simple and it's a straightforward road up until the final frame. When the movie shifts from the war opening to Shanghai, the confusion sets in though. It feels like we've missed out on at least one or two scenes since it feels like we're right smack in the middle of Shanghai and Tony Leung's life as a police. That we don't get everything explained works in other movies but here we are questioning whether it's a flashback or if we're in the present. This is just one example of many questions we as an audience have during the course of the movie. Scenes, characters and key events comes and goes without enough logic and this really hurts this good looking movie. One of the key notes I made when I watched the movie was this: CHARACTER MOTIVATIONS! There are again more examples of absence of proper character motivation but I'll mention one that bothered me the most. Ding Chun Bei runs into the prostitute Mona Fong (Elizabeth Lee from Return Engagement) and is more and more drawn to her than to his own family, maybe because he sees a chance to save her out of the hole she's dug for herself. Now this is all well meant but WHY he does why he does should've been expressed more clearly. Again I felt scenes were missing regarding this aspect of the story also and because of all this things mean less than what they should've. There's also a hefty amount of tired clichés and situations like Tony Leung encountering problems with his superiors in his hunt for Haye but that was just a minor gripe compared to the other flaws in the script. Even some Hong Kong movies that has the plot made up on the day of shooting manages to become logical enough at the end of the day but the screenwriters of Gunmen doesn't. By now you must think this is a real turkey but amazingly enough that's not the case. While the flaws are quite big the film does deliver in one crucial department: the action, choreographed by Fung Hak On and Bruce Law. Fung Hak On is a familiar face to fans of Sammo Hung and Jackie Chan since he's played the bad guy (or one of them) in some of their productions including Iron Fisted Monk and Police Story. Bruce Law is also a respected name in the stunt world where he has delivered action choreography for Crime Story and Full Throttle among others. The duo delivers a good and extensive amount of action mostly consisting of gunplay but also some well executed stunts. The gunplay isn't stylized like John Woo does it but still delivers some adrenaline rushes and a fair level of brutality for a Cat III-movie. 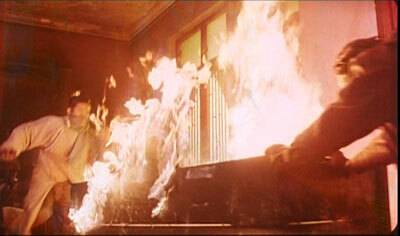 Stuntwise the most memorable scene have the be the one where several people are set on fire in quite lengthy takes. Looks dangerous to say the least and god bless these brave stuntmen. In the excellent action finale some character sympathy is finally on found and it's a shame that wasn't achieved earlier in the piece. Special mention has to go to the cinematography by Andrew Lau (director of Stormriders) and Lam Kok Wah. It's a varied but still subdued colour palette that is shown here but doesn't look less professional because of that. As mentioned, I would've liked to see more of the sets and such but their work still results in some a+ cinematography. On the acting front we also find some fan favourites. Their performances doesn't come off as good as they should because of, again, the weak script but some of these guys have the charisma to pull it off adequately. Tony Leung Ka-Fai has just gotten better and better during the 90s and in 1988 he already showed the skill to carry a movie as a leading man. I've always enjoyed his work but the 'other' Tony Leung does not have to feel threatened in the acting world. Gumen's bad guy is played by Adam Cheng and is the character that feels the most interesting. 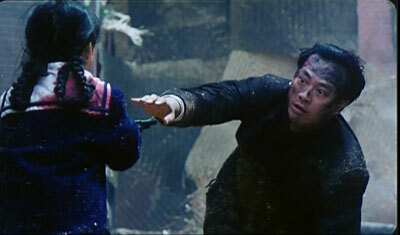 Even if his brutality is anything but sympathetic, his desire to wipe out Ding Chun Bei feels a bit justified after a key scene in the film. Adam played both good and evil in Zu, something I quite liked and he does act well here too without harming the picture more. I was also pleasantly surprised by Waise Lee's performance. His turns in A Better Tomorrow and Bullet In The Head had evident traits of overacting and even though his character isn't deep he still comes off as good thanks to the calm side of his character. Seems more suiting for Waise and some of the best I've seen him do. Strangely enough I do recommend Gunmen. Despite it's weaknesses, as a whole it becomes quite watchable thanks to the action and the cinematography. 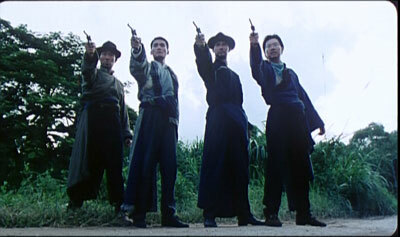 There are not many Hong Kong gangster movies set in the 1920s (only seen David Lai's Tian Di tackle the same era) so take your chance and see one. Megastar's dvd is framed at 1.85:1 and looks very good throughout. Print damage is not too bad and the different colours of the cinematography comes across nicely. The Cantonese Dolby Digital 5.1 track is one of those mixes that thankfully stays pretty much centered throughout, thankfully. It's more than acceptable audio for an older movie. Also a Mandarin 5.1 dub is included. The English subtitles are of decent standard with the usual spelling and grammar error found here and there. Some lines go completely un-subbed though but this does not make you miss any crucial plot. Japanese, Korean, traditional Chinese and simplified Chinese subtitles are also on the disc. Extras consist of a plot synopsis, a cast & crew listing (with short biographies for Tony Leung Ka-Fai and Waise Lee), the trailer for Gunmen plus the Media Asia DVD Promotional Trailer.